Luxio has captured the interest of many players because of its single, Colorless attack Disconnect which, in addition to doing thirty damage, prevents your opponent from playing Item cards during their next turn. Last year at this time, this would have been a great attack. This year, not so much. Especially early on in games. As you may or may not know, when I’m not playing Ninetales Milotic, I’m probably running Golisodor. I count my opponent’s Items in the discard like crazy with that deck, and you never see Items in there early in the game. It’s not until mid to late game when they just don’t have any choice and have to Sycamore away a hand full of Items that you see Items start to drop in there. That means that we can work around not having to use Item cards right now. I remember running a Greninja deck a few months back that only had Dive Balls and a couple other items. I think my total Item count was something like six Items. But that was back when people actually played GRI Garbodor. So sorry for your luck, Luxio, but right now we live in an Item poor meta. No VS Seeker, no Trainers Mail, no Trick Coin, not even Lucky Skates. I wouldn’t be surprised if down the road a bit – maybe next year at this time – when we get more Items that are worth playing, then maybe this attack will become more relevant. And let’s not forget that the last year of Luxio’s time in the Standard format will be Trashalanche free, so it might very well be that this is one of those cards you stash in your binder. Maybe two years from now we’ll be cycling through old UP cards on PTCGO and remember that this card actually exists and might work great in an Item heavy format. But that day is not today. If you do want to give little Lux a shot though, and maybe even want to pair him with Garbodor (because that worked so well with Noivern GX), there are a number of cards you might want to work into that potential deck list. Shining Celebi – so you can add HP on to Luxio without having to break the Item lock. Cobalion – I’ve seen this teched into a couple of lists. Definitely a Pokemon that’s getting overlooked in the Metal craze we’re currently experiencing. Max Potion – it’s a single attachment attack. Those beg for Max Potions. Counter Catcher – chances are your Luxio is going to get KO’d. Counter Catcher will help you stall for time to continue your development. Counter Energy – definitely a possibility, especially since I think you’ll be trailing a LOT with this deck. As you can tell, I’m not real hot on this archetype. I do believe that it may have a place in the meta at some point. Its being a Colorless attack definitely presents the opportunity for it to be splashed into a deck at some point down the road. I just don’t think this is a great deck right now. If it makes you feel any better about the Item lock Luxio, consider this: his evolution has the ability which reduces damage BEFORE applying weakness and resistance. What does that mean? Aside form a -50 damage reduction when hit with Metal, here’s where it gets hilarious: Buzzwole with just one fighting energy and nothing else will do ZERO damage to a Luxray already out. With Fighting Fury Belt: just 20. With Strong energy and no Belt: 40. If Luxray has on Assault Vest, Buzzwole will not be able to lay a scratch on him until he field blowers the vest away or Ability locks. All wishful thinking, but it’s worth a try, at least for fun games in real life and Electric type challenges on PTCGO. I’m going to go off topic here but…. Looking back when all the Special Energy was running about, Assault Vest did appear appealing for many pokemon: For Luxray, Golisopod, and even Diancie EX: a reduction of 70 damage by attacks just seems so good. Only problem is that once Field Blower finally came out, well…a lot of decks got ruined. Megas got nerfed, hitting Mewtwo EX the hardest, the Xerneas/Diance EX deck I once won a lot with can no longer stand up in the meta anymore, and Assault Vest never saw a bunch of real play because yes: there are many decks that can hit without special energy (Golisopod GX hitting like a truck effortlessly). I thought about Field Blowers impact on the meta way back and it most certainly changed things up, mainly in combating what was at the time Garbotoxin’s notorious reign in standard pre-rotation. At the same time it was just so bittersweet (case in point: when I could finally trade for Mega Mewtwo Y for so low that it was ridiculous). Tauros GX was probably a bigger example of this: With Fighting Fury Belt, he tanked hits and delivered them right back. Today: I rarely ever see him in my matches, and I’ve tried to see if I could bring him back in a build, but right now: he’s there until further notice. So Luxray…Luxio….I want him to shine, but I’m being realistic here: he probably won’t shine so bright. Case in point: Shining Celebi. Shining Celebi mentioned in Gyarados GX builds, sees no play. Mentioned in Charizard Gx builds alongside Fliptini, sees no play (if Pokemon ever makes something insane like a Houndoom that reads, “When you play this Pokemon from your hand to evolve 1 of your Pokemon during your turn, you may discard the top 2 cards of your opponent’s deck”, then I could see Charizard GX having some play, and it would give some homage to the Houndoom Ex that will rotate out this year, but that’s just fantasy talk). Volkner however is a must for decks that play Luxray, or any electric deck running a stage two: for this build and Breakthrough’s Magnezone, ditch Skylas, add Volkner (gives you a lightning energy to get up and running as well). 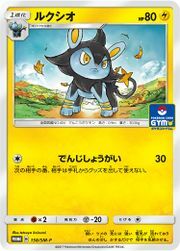 Possible tech for those that still wish to use Luxray: Mew EX. Hit for weakness, preserve Luxios, and works with Max potions to avoid knockouts from a variety of pokemon (do run Parallel City to lock your opponent out of using Field Blower). Using Garbodor would be quite oppressive, since you shut down your opponent from using Abilities and items…but not sure how that would go. To wrap things up, Luxray…you were my go to electric type in the Sinnoh region. Alongside Infernape, Lucario, Staraptor, Garchomp, and Floatzel, my 14 year old self went into the league, only to get blown back by Cynthia more than once or twice…but we still made it. Your Break does your name no justice, and like Torterra and Chesnaught, I sit and wait patiently for the day that you and my favorites find some love over the horizon. Hey Juan – hopefully you’ll see this – would you like to join in our roundtable review of Ultra Prism?